If you’ve had a chance to get your hands on FIFA 17, you’ve probably spent some time with The Journey. It’s a big part of the experience this year, utilizing the power of the Frostbite engine to deliver a story-based, single-player feature for the first time in the series’ history. It has been generally well-received thus far, and player engagement has been high, as noted in a recent EA infographic. Still, it isn’t perfect. The mode follows a fairly structured form that never deviates from the script too dramatically, whether you’re excelling in front of goal or making countless blunders. The mode’s detractors will understandably point to this as a negative factor, but fail states do exist, and the game will adapt to your inconsistencies to a point if you’re unable to perform up to scratch. We’re going to take a look at a few fail scenarios you might encounter, but keep in mind that spoilers are ahead. 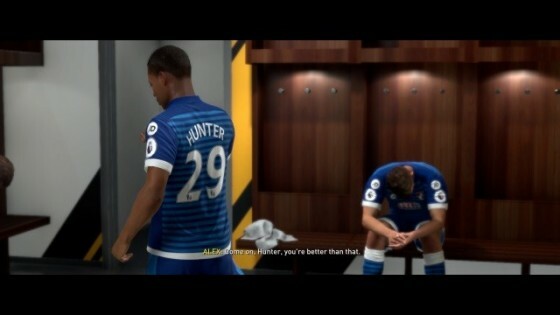 The very first sequence of the story features a young Alex Hunter stepping up to take the crucial penalty in a youth game. The stakes are high, but the punishment for failure isn’t as devastating as it first appears. If you miss the spot kick, you’ll be consoled by your best mate Gareth Walker as the opposing team misses as well. Gareth then takes the glory by netting the winner himself, giving your team the win. The next stage focuses on the exit trials — a series of training drills and practice matches to determine whether you have what it takes to compete in the English Premier League. It’s fairly unforgiving, and if you don’t perform to expectations, you’ll be informed that you haven’t made the grade. If this happens, it’s game over unless you want to try again. It’s not all that difficult to put in the types of performances that keep the mode progressing at a constant pace. Even if you struggle on game day, a few ‘A’ grades on the training pitch will largely even things out. That said, you might encounter the odd cutscene that requests you to improve your game. However, it is possible to be fired if you can’t cut the mustard. 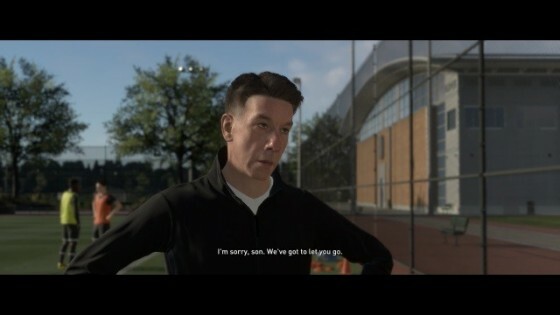 By consistently failing to perform in games and training sessions, it can eventually lead to a scene in which Alex is released from his parent club. The game then gives you an opportunity to replay the previous week in the hope of turning your fortune around. Early on, your initial success is cut short by the arrival of Harry Kane or Angel Di Maria at your chosen team. As a result, you’re sent on loan to hone your skills, and this is the case no matter how well you’re performing at this point. After you arrive in the EFL Championship, it would appear that nothing can derail your progress. You can be warned about your performances, but in my experience, it seems you’re destined to eventually make it back up to the big leagues in alignment with the story’s progression. The final contest takes place in the English FA Cup Final, and it’s a challenge that you can win or lose with fairly similar outcomes either way. If you win, you’ll be presented with a celebratory cutscene in which you console your ex-pal Gareth Walker and end your ongoing feud. If you lose, the roles are reversed, and the scene ends with you and your teammates hanging your heads in disappointment. To enhance these scenarios, there are plenty of relevant cutscenes dotted throughout the mode’s progression. It’s still true that The Journey follows a pre-determined route for the most part, but while that might not offer as much variation as some would like, there’s just enough here to make each playthrough feel somewhat unique. In any case, The Journey as a whole represents a good first effort for a feature that looks set to establish itself as a regular part of the series for years to come.